The Daring Bakers’ go retro this month! Thanks to one of our very talented non-blogging members, Sarah, the Daring Bakers were challenged to make Croissants using a recipe from the Queen of French Cooking, none other than Julia Child! I don't typically complete the DB challenge until the last minute, but still get it posted in time. Ironically, this month I actually completed it by mid-September, but couldn't get it posted in time. I was supposed to get this post up on September 27th, but I've been sick, working, chasing around a toddler, and getting ready for a trip. So you'll have to forgive me if this post is short and sweet. Making croissants really isn't as hard as it might sound (time consuming, yes, but not very difficult). It simply involves rolling out some dough, adding a layer of butter, and then folding it over several times until you've got layers of alternating dough and butter. As it bakes up in the oven, it puffs up into wonderful, buttery, flaky layers. 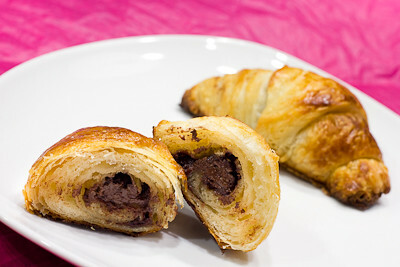 I filled my croissants with nutella and they were delicious. I baked up a few and then put the rest in the freezer so that I can enjoy more at a later date. Thanks Sarah, for hosting this month's challenge. Nothing beats a fresh, homemade croissant and these were no exception! Make sure you check out the Daring Bakers' Blogroll to see how everyone else enjoyed these flaky, buttery, treats. Recipe Source: Mastering the Art of French Cooking, Volume Two. Julia Child and Simone Beck. 1. Mix the yeast, warm water, and first teaspoon of sugar in a small bowl. Leave aside for the yeast and sugar to dissolve and the yeast to foam up a little. 4. Place the flour in a large bowl. 8. Knead the dough eight to ten times only. The best way is as Julia Child does it in this video. It’s a little difficult to explain, but essentially involves smacking the dough on the counter (lots of fun if you are mad at someone) and removing it from the counter using the pastry scraper. 9. Place the dough back in the bowl, and place the bowl in the plastic bag. 10. Leave the bowl at approximately 75°F/24°C for three hours, or until the dough has tripled in size. 11. After the dough has tripled in size, remove it gently from the bowl, pulling it away from the sides of the bowl with your fingertips. 12. Place the dough on a lightly floured board or countertop, and use your hands to press it out into a rectangle about 8 by 12 inches (20cm by 30cm). 14. Place the dough letter back in the bowl, and the bowl back in the plastic bag. 16. Place the double-risen dough onto a plate and cover tightly with plastic wrap. Place the plate in the fridge while you prepare the butter. 18. Place the block of chilled butter on a chopping board. 19. Using the rolling pin, beat the butter down a little, till it is quite flat. 20. Use the heel of your hand to continue to spread the butter until it is smooth. You want the butter to stay cool, but spread easily. 21. Remove the dough from the fridge and place it on a lightly floured board or counter. Let it rest for a minute or two. 22. Spread the dough using your hands into a rectangle about 14 by 8 inches (35 cm by 20 cm). 24. Spread the butter all across the top two-thirds of the dough rectangle, but keep it ¼ inch (6 mm) across from all the edges. 25. Fold the top third of the dough down, and the bottom third of the dough up. 26. Turn the dough package 90 degrees, so that the top flap is to your right (like a book). 27. Roll out the dough package (gently, so you don’t push the butter out of the dough) until it is again about 14 by 8 inches (35 cm by 20 cm). 28. Again, fold the top third down and the bottom third up. 29. Wrap the dough package in plastic wrap, and place it in the fridge for 2 hours. 30. After two hours have passed, take the dough out of the fridge and place it again on the lightly floured board or counter. 33. Roll the dough package out till it is 14 by 8 inches (35 cm by 20 cm). 35. Turn 90 degrees, and roll out again to 14 by 8 inches (35 cm by 20 cm). 43. Roll the second rectangle out until it is 15 by 5 inches (38 cm by 12½ cm). 47. Cut the square diagonally into two triangles. 48. Stretch the triangle out a little, so it is not a right-angle triangle, but more of an isosceles. 49. Starting at the wide end, roll the triangle up towards the point, and curve into a crescent shape. 51. Repeat the process with the remaining squares of dough, creating 12 croissants in total. 53. Preheat the oven to very hot 475°F/240°C/gas mark 9. 57. Take the croissants out of the oven, and place them on a rack to cool for 10 minutes before serving. Yum! I've been wanting to try this s'more croissant recipe floating out there and would love to attempt from-scratch croissant dough! This recipe will be perfect for my attempt. im just about to make some crossiants wish me luck! love your blog - gorgeous and inviting food..